MANILA, Philippines – The August 2018 Mechanical Engineer (ME) and Certified Plant Mechanics (CPM) board exam results to include the list of passers, topnotchers (top 10), top performing schools and performance of schools are released online on Friday, August 31, 2018 or in four (4) working days after the exam. 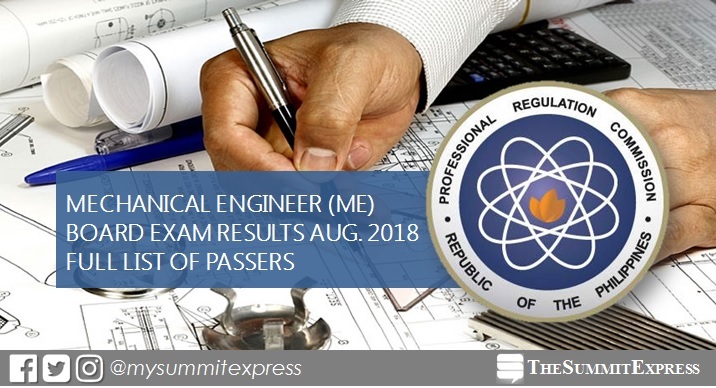 The Professional Regulation Commission (PRC) and the Board of Mechanical Engineering administered the licensure exam in the cities of Manila, Baguio, Cagayan De Oro, Cebu, Davao and Lucena on August 25 and 26. From September 10 to September 19, 2018, registration for the issuance of Professional Identification Card (ID) and Certificate of Registration will be done online. Please go to http://online1.prc.gov.ph and follow instructions for initial registration. According to PRC Resolution No. 2017-1068, the target release of Mechanical Engineer board exam results is on Friday, August 31 or in four (4) working days after the exam. However, results may be released ahead of the target or in later date. Note that August 27 is a holiday for National Heroes Day. We advise takers to monitor annoucement of results starting Thursday, August 30 or in 3 working days. In the same period last year, results were released online in 3 working days. A total of 3,517 out of 5,098 (68.99%) passed the mechanical engineering licensure exams while 31 out of 105 hurdled the CPM exams. In the September 2016 exam, results were also announced in 3 working days. PRC named 3,110 out of 4,470 (69.57%) who passed the ME board and 40 out of 68 (58.82%) for the CPM exams.